Buckeye cookies, chocolate-dipped peanut butter balls, are an absolute treat that we can never get enough of. They’re one of our favorite sweets, but turning them into brownies was seriously one of the best life choices we’ve ever made. Rich brownies topped with a fudge-like peanut butter filling and covered in a peanut butter chocolate glaze? Yes, yes and yes. These are super decadent, so be aware of that as you’re cutting your buckeyes into squares a little goes a long, long way and that’s just the way we like it! These bites will blow you away, so get cooking and try ’em out ASAP! Line a square or rectangular baking dish with parchment paper, leaving a 2-inch overhang on both sides, and prepare brownies according to (packaging) directions. In a large bowl or mixer, cream together the peanut butter, butter and salt on medium speed until lightened in color and fluffy. 3-4 minutes. Reduce speed to low and alternate adding in powdered sugar and milk, beginning and ending with powdered sugar. Mix in vanilla extract and beat until you’ve reached desired consistency. Note: add a splash more milk if mixture is too dry. Evenly spread peanut butter mixture over the cooled brownies and set aside. Place peanut butter, chocolate chips and vegetable oil in a microwaveable bowl and microwave at 20-second intervals, stirring in between, until mixture is completely melted and smooth. 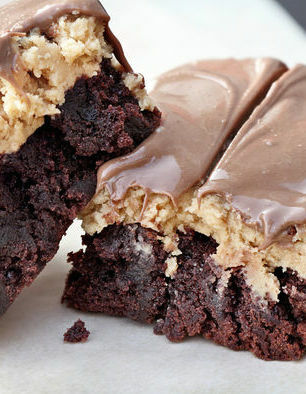 Pour melted peanut butter chocolate over the brownies and let set. Then cut into squares. Serve chilled or at room temperature (or place in an air-tight container and store in refrigerator) and enjoy!